Every year thousands of people, from around the world flock to the golden sands ready to enjoy the Aussie Summer. Full of holiday goers and locals surfing and just catching a tan. The beach is clean, full of fun and atmosphere. 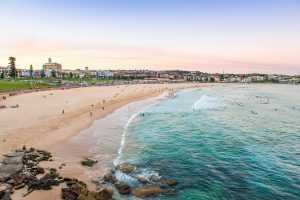 With all that Bondi Beach has to offer it is no wonder why it is considered Sydney’s number 1 tourist beach. Bondi Beach offers a broad range of activities you can do. Take a dip in the surf before walking the famous scenic path from Bondi to Coogee Beach. Stroll through the markets or grab some fish and chips and relax in the grassy area overlooking the beach. 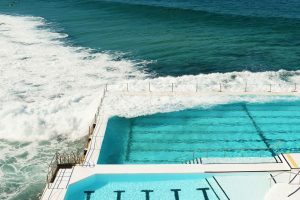 If waves are not for you take a dip in The famous Bondi Baths which have been a historical landmark of Bondi Beach for over 100 years. Featuring both a larger lap pool and a smaller children’s pool underneath the famous Icebergs restaurant. Campbell Parade (the main street along the beach). This is where you will find a range of outdoor cafes, bars, surf and fashion stores. Beyond the beachfront strip lies a village of further cafés, restaurants and designer shops. If you are looking for an upscale dining experience be sure to visit Icebergs restaurant enjoy panoramic views of Bondi Beach while savouring the delectable flavours by Maurice Terzini and Head Chef Monty Koludrovic. You may even spot a celebrity while dining here. Throughout the year the beach is the host of many events. From the annual City to Surf fun run to the Festival of the Winds kite flying festival. The Bondi Winter Magic Festival is also fun with an ice-skating rink. There is always something interesting to see no matter what the time of year. To find out what is happening at the time you will be travelling to Bondi click here. While Bondi Beach is famous for its beauty it also sometimes can be dangerous. You would not be wise to swim outside of the iconic red and yellow safety flags due to the undertow and rips. The beach is under the watchful eye of some of the world’s most experienced life guards. They perform around five thousand rescues over the summer period alone. 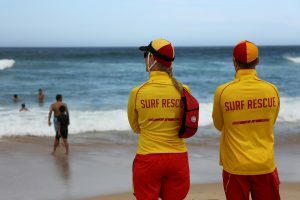 You may have seen our famous lifeguards on the television show “Bondi Rescue” which is aired in over 100 countries. The protected waters of Bondi are the perfect place to learn to surf with the local surf school to teach you how. And at the end of the day make sure to save enough energy for the buzzing nightlife this beach has to offer! 5 star Sydney tours offers private guided tours of Bondi Beach. Our friendly tour guide is a local and will share with you valuable information and many laughs. To enquire about our private guided tours click here. Overlooking Bondi Beach in Sydney during the sunset.